Arima Fest Box Kart Derby – Drag Racing. Carded for 14th July 2013. Age 12 and Under	Over 12 Female at least three entries. Most impressive design Best-dressed competitor. (5) Safety Requirements: Helmet, Elbow pads - Knee pads - Long pants and shoes. (6) Pit Area – Royal Bank Car Park. (8) Finish – Former Marios. (9) Full Drag Racing Timing system will be used. (10) Start Procedure: Karts to be lined up on ramp before Christmas Tree, with small chuck or braking system to prevent rolling forward. Once ready, chuck will be triggered as the starter presses his button. (11) Wheel size/type to be no more than 16 inches. And Kart not wider than 3 feet. (12) Space must be provided for Competition Numbers to be clearly displayed on front and sides. (13) Competition – to be determined depending on number of entries. (15) NOT motorized in any manner! (16) Must NOT be an already built chassis or must not be any type of racing chassis. (17) Must have some type of simple braking system. (18) Must have a place to connect a hook, to facilitate towing back to top. No Entries accepted after 12 noon. Start at 1:00pm – provided Police give the all-clear. First 90 minutes will be for test runs for ALL competitors. And again repeat requirement of a hook to tow Karts back to the top. Simple Drag Racing Rules will apply, including loss of run if centre-line is crossed. unfortunately that date clashes with something else. that entry fee is for spectators too? dougla_boy wrote: that entry fee is for spectators too? Entry fee for spectators is come with your family, your cooler and have a good time. Entry fee shown is for competitors. Do they have like ppl renting their go cart to take a spin? If they stick to the drawings, the base of the ramp should be 12ft. and the height at the back should be 4ft. Which means that the ramps should have an angle of about 15 degrees instead of the 45 degrees that we started out with last time. 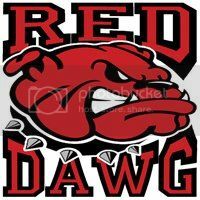 The price to attend is free and should the Rampersadsings and others take part, I understand from last night's meeting that $10,000 in prize money will be distributed across the board. Some of us wasting time racing cars with engines that burn fuel, so build a box with four wheels, get paid and retire. And the ramp has actually been built to specs. suggested. We are allowing kart width to be up to 3 feet 6 inches, and length- wheel base 6 feet. Following our briefing meeting on Wed. night, and with dialog with those in attendance, we have agreed, as suggested by the females present, that there would be no separate class for female competitors. Concerns were expressed about those holding the Kart before start, attempting to give a push. We shall have two separate officials looking at the release by those holding. If there is any attempt at pushing, the competitors will receive a one-second penalty. If there is a second attempt at pushing, a two-second penalty will be applied. A third attempt and the competitor shall be disqualified. Our ARA team will be there from 9:00am when the road will be closed off and we put the infrastructure in place. We hope to complete this by Noon and have a formal opening by his Worship the Mayor of Arima and his Team. Then hold a drivers meeting. Then we get into practice. The length of practice will be determined by the number of competitors registered. No entries shall be accepted after 12 Noon. All competitors shall report to the Control Tent where Arima B. C. officials shall collect the entry form and entrance fees, and issue competition numbers. On arrival at Arima, competitors are permitted to enter the Car Park of Royal Bank - go pass the Market from the West, go straight at the Cross Road, swing right into the RBC Car Park. From the Car Park teams can pull their Kart through the RBC Exit tunnel, and on to the road, which will be the pit area. Congratulations AutoSport - another event well done! Sorry we weren't there on Sunday with our box cart to defend our 2nd and 3rd place wins from last year. Now, I do believe Rawle accepted a bribe so the Mayor could win. We will have to investigate this. We are going to call in the same team that is investigating the e-mailgate right now - okay as soon as they have done the PNM/PP case - so we should have the final result of this in a few years. In the meantime congratulations to the people of Arima for supporting this event and the Mayor. canada wrote: Congratulations AutoSport - another event well done! Sorry we weren't there on Sunday with our box cart to defend our 2nd and 3rd place wins from last year. Now you see why the only rich people in this place are lawyers and Politicians! Is the "holder", the man holding my Kart that probably collect the money. I did explain that I have already lodged a protest and paid my protest fee of $500.0 to object to the manner in which the Mayor's Kart shot off the ramp. The International experts already checking for NOS and hidden Turbo. And then we going after the DNA. And people trying to tell me bout "power to weight"! 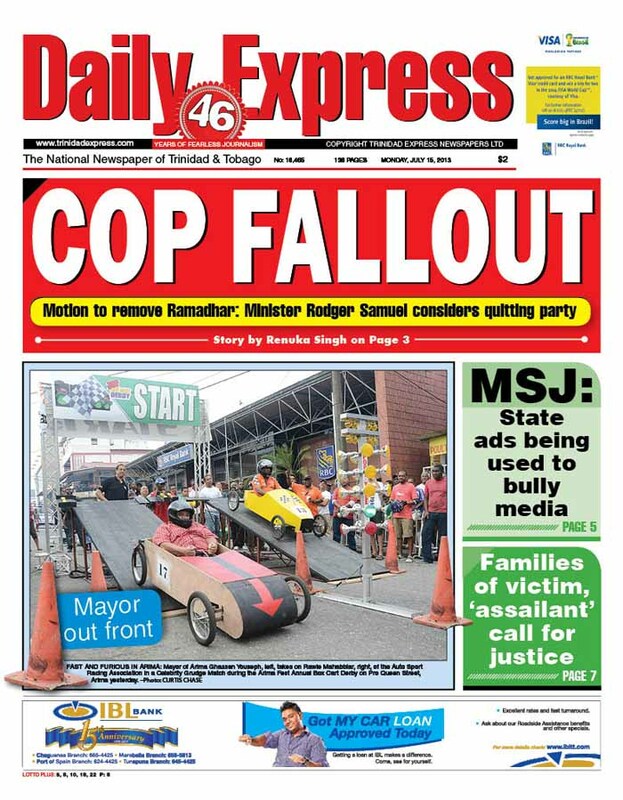 Funny how AutoSport had this Box Kart Derby in Arima, well executed and praises all around.....and we make the front page of the Express today! And no, we didn't pay any bribe for that! Team Cozier / Red Dawg Racing would like to congratulate his worship, Mr. Ghassan Youseph, the Mayor of Arima, the Arima Borough Corporation and Autosport Promotions Ltd. on the successful running of the Second Annual Arima Fest Box Kart Derby. Narend Sooknarine, Zorce Publications, Zorce Racing Magazine. C. W. Cozier and Janice Cozier, for allowing us to turn their garage into a woodworking shop. The event was held as part of the 125th Anniversary of the Royal Chartered Borough of Arima. We thank His Worship the Mayor Mr. Ghassan Youseph, Council and Corporation of the Borough of Arima. We thank the Deputy Mayor, Councillor Patricia Cedeno-Metivier. Sponsors making this Event possible…. RBC Royal Bank Arima for use of their Car Park. TTKA and their President, our Official Announcer! 1st 13	Tyler Rampersadsingh coming all the way from Princess Town! Look how a lil effort can bring so much fun, expose the younger ones to what a real box Kart with "skater wheels" looks like and provide a handsome pay-day!